Gerry Carr Painting & Decorating - Painter/Decorator based in Surbiton, Surrey. At Gerry Carr Painting and Decorating I can offer you high quality and professional painting and decorating services aiming for 100% customer satisfaction. Most of my work comes from recommendation’s and repeat customers that I have built up over the 18 years from hard work and dedication to my business. Using Gerry Carr Painting Decorating Services you will get a high standard of workmanship with a high quality finish with attention to detail. I work closely with all my customers, because I'm very passionate about my work. I will take on board all your ideas and sit down with you and talk through your colour schemes and give you friendly advice to bring the environment back to life using high quality paints & decorating materials. 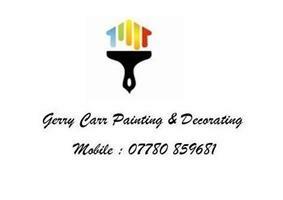 Gerry Carr Painting & Decorating look forward to hearing from you for your free quote today.